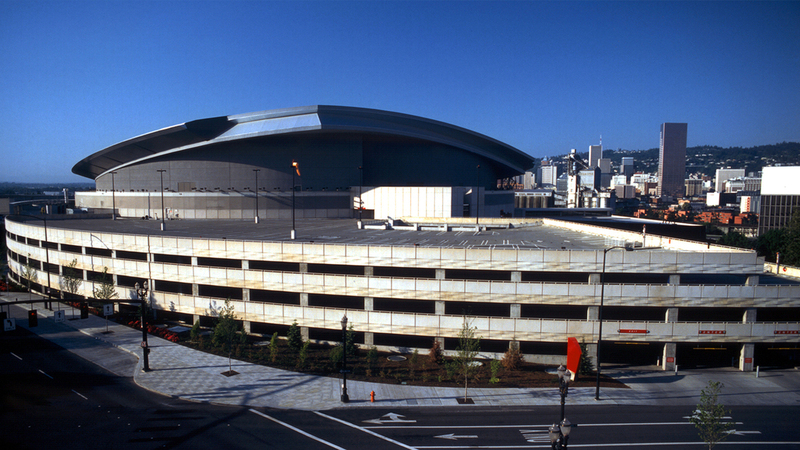 Rose Garden Arena Parking Structure | Cary Kopczynski & Company, Inc.
A steep site, awkward access and a curved layout were just some of the challenges facing the designers of the Rose Garden Arena parking structure. When it was determined that the original team’s design would result in a serious construction cost over run, CKC was retained to redesign the project. The use of ductile frames in lieu of shear walls, combined with a significant change in layout developed with CKC’s functional consultant, stream lined the circulation and greatly improved the efficiency. Member sizes were standardized to simplify form-work and perimeter walls were stair-stepped to eliminate site shoring. The result was a construction savings of $4 million.